For the song by Nogizaka46, see Barrette (song). For the sport of barette, see Barette (sport). A barrette (American English), also known as a hair clip, hair-slide or clasp (British English), is a clasp for holding hair in place. They are often made from metal and/or plastic and sometimes feature decorative fabric. In one type of barrette, a clasp is used to secure the barrette in place; the clasp opens when the two metal pieces at either side are pressed together. Barrettes are worn in different ways partly according to their size, with small ones often used at the front and large ones in the back to hold more hair. They are used to keep hair out of the eyes, or to secure a bun, a French twist or a ponytail. Short metal "clip" barrettes are sometimes used to pull back front pieces of hair. Barrettes are also sometimes used purely for decorative purposes. Larger barrettes (some can be as long as 3–4 in (8–10 cm)) are designed to pull back (and, often, up) longer hair or a large amount of hair and are usually worn at the back of the head. If the intent is to pull hair back, the length of the barrette is not the only consideration; the width of the barrette also indicates approximately how much hair can be secured by it. Many different kinds of hair clips have been invented in the 20th century. 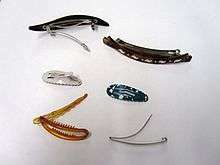 The more famous ones are the elongated hair clip (seen at the top of the "Various types of hair slides" image) which was invented in 1972 by Marnie Bjornson (cf. "Marnie Scrunch", below) and the simple "clips" hair-clip, which works by snapping the clip from a concave to convex position, springing it into a locked position, or opening it. Several of these are seen in the image. Wikimedia Commons has media related to Barrettes. ↑ "Barrette Types". Fox Den Productions. Retrieved 4 April 2015.